We love our student employees! The end of the academic year is a good time for us to reflect on the many benefits of having student employees in the libraries. Graduation is a bittersweet time for us – we’re excited to see many of our students moving on to the next phase of their lives but we also know that their shoes are going to be hard to fill. The benefits of having student employees in the libraries are many! It’s no exaggeration to say that we couldn’t maintain our current service levels and open hours without the help of student workers. Together, Herrick and Scholes Libraries are open almost 200 hours per week during the academic year. During any given semester, we employ nearly 100 students. 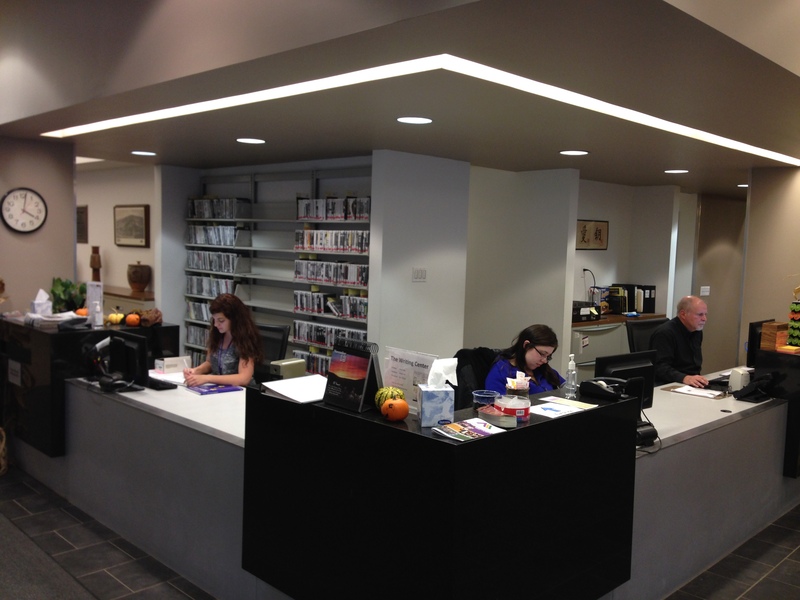 In addition to staffing our front desks, students serve in a variety of other roles in the libraries, from preparing materials for circulation to doing data entry, assisting with projects, shelving, and much more. The relationship between student workers and the libraries is symbiotic: students gain valuable work experience and we benefit in numerous ways from having them here. After all, most of our patrons are students, and our student employees are their peers. Natalie Skwarek, who supervises students at Herrick’s front desk, notes that, “because student workers are students, our patrons, who are also mostly students, feel comfortable approaching them with comments and questions.” Student employees frequently find creative and unconventional solutions to problems, and make suggestions for improving library services. Connections between the libraries and their student workers often endure beyond graduation. “The relationships we foster with our student workers can prove helpful in securing future employment,” says Dave Snyder, Access Services Coordinator at Herrick. Prospective employers regularly contact library staff for references and Snyder says that, because he works so closely with the students, he can often relay a story that illustrates a student’s positive character traits and capacity for growth. As we move towards the start of a new academic year, we look forward to hiring a new group of students who will become part of this ongoing cycle. If you are an incoming student who is interested in working in the libraries, we invite you to stop by to see us after you’ve arrived on campus.